JAKARTA – In the penultimate week of the campaign to elect Indonesia’s next president, both candidates in an increasingly-tight race tried to refute malign contentions about their suitability for office in the world’s biggest Muslim-majority country and third-biggest democracy. 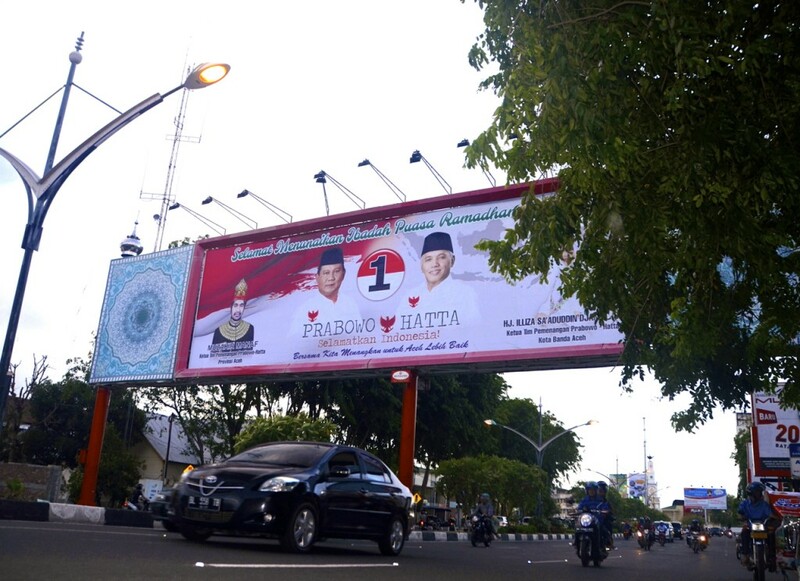 Midway through the first week of Ramadan, Joko Widodo visited Islamic schools in West Java, a vote-heavy province on the island where around 60% of Indonesia’s near 250 million people live. There he prayed with clerics and handed out iftar (fast-breaking) snacks to the faithful, a show of piety that came after a potentially-damaging smear campaign – spread in part through a tabloid handed out in Islamic schools – that branded him as a closet Christian of Chinese descent, rather than a Javanese Muslim. In response, the would-be president has been handing out his own newspaper, saying “we wanted to convey correct information through our own tabloid. There is no need to create a tabloid that puts down others,” according to Tribun News, an Indonesian newspaper. The infidel conspiracy is aimed at debasing Widodo’s credibility in a country where over 200 million people are Muslim. Regardless of the truth, the allegations have surely has helped Jokowi’s adversary, the fomer special forces commander Prabowo Subianto, catch up in opinion polls and turn what looked like a foregone conclusion into a contest that looks too hard to call. Just a few weeks ago Widodo held was seemed like an unassailable lead – a popularity stemming from an affable pragmatism and what voters seem to regard as a solid record, as mayor of his home town Solo and as governor of Jakarta, one of the world’s biggest cities. In March, before the April 9 parliamentary elections, polls asking who should be Indonesia’s next president showed Widodo at around 40%, with Subianto languishing in the teens. By mid-June, it was almost neck in neck, with around 20% of Indonesia’s almost 200 million voters seemingly undecided. Momentum is with Subianto, who this week got the backing of the Democrat Party and soon-to-be former President, Susilo Bambang Yudhoyono, or SBY, the clear winner of the last 2 presidential elections in 2004 and 2009. A late March survey, however, listed the Democrat Party as the party “disliked the most” by voters, an outcome confirmed, in part, by the April 9 parliament elections in which the current President’s party saw its support halved from 2009, so SBY’s backing might not help Subianto that much. The same April legislative elections resulted in Subianto’s Great Indonesia Movement Party (Gerindra) almost triple its support – an outcome that helped Subianto emerge as the sole rival to Widodo, who has the backing of parties that will comprise 40% of the next parliament. But despite his recent surge in opinion polls, Subianto too has been on the backfoot – fending-off accusations that he wants to dial back Indonesia’s much-lauded democratisation by ending direct elections for the presidency and reverting to a constitution dating to 1945, which critics say is too vague, and therefore prone to executive whimsy. “It’s not democracy versus authoritarian government. I sort of sense where you want to lead this question. Because I am being created as somebody who is anti-democracy,” Subianto said, in an account posted on New Mandala, a southeast Asia-focused website run by academics at the Australian National University (ANU). Subianto has been accused of orchestrating the disappearance of pro-democracy protestors during the ousting of former dictator Suharto (to whose daughter Subianto was previously married) in 1998, as well as having a hand in massacres carried out during Indonesia’s brutal occupation of East Timor, which ended in 1999. But after a decade of a SBY Presidency marked by indecision, numerous corruption scandals and the failure to move the economy beyond commodity extraction, Subianto has been pitching himself as a forthright, even intuitive, leader – a visionary who knows what Indonesia needs, rather than a manager or technocrat, which is how Widodo is perceived. In a country where 9 out of 10 citizens as see parliament as corrupt and where even the former top judge can be jailed for graft, as happened last Monday, Widodo has stood out as an exemplar of clean politics. In contrast, Subianto’s ex-wife, Titiek Soeharto, who made a fortune in murky circumstances during her father’s rule, has appeared at several of the Gerindra candidate’s campaign events, prompting speculation that the estranged couple could get back together, if Subianto wins the presidency on July 9.